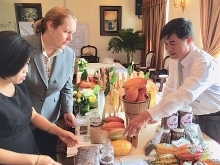 (VEN) – A recent conference in Hanoi addressed cooperation between the Vietnamese General Department of Customs and the Cambodian General Department of Customs and Indirect Taxes in order to promote trade between Vietnam and Cambodia. Bilateral trade between the two countries has increased to US$3.25 billion in 2014. This included more than US$2.6 billion worth of Vietnamese exports to Cambodia such as gasoline, oil, iron, steel, animal feed, fertilizer, plastic ware, textiles, garments, textile and garment materials, means of transport and spare parts, and more than US$625.2 million worth of Cambodian exports to Vietnam such as cashew nuts, maize, tobacco materials, wood, wood products, rubber, and waste iron and steel. Vietnam sold about US$205.6 million worth of goods to Cambodia in January 2015 and bought about US$85.4 million worth of goods from this country. The two parties expected to increase total trade revenue to US$5 billion by the end of the year. To make this happen, apart from macro solutions to promote economic, trade and investment cooperation, it is necessary to facilitate imports and exports between the two countries. For this reason, Vietnamese and Cambodian customs leaders discussed technical issues to improve state management and cooperation in customs to best facilitate trade and to improve people’s understanding of Vietnamese and Cambodian laws and policies. 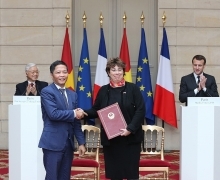 At the conference the Vietnamese General Department of Customs proposed that the two countries implement the memorandum of understanding between the two governments and the agreement between the two customs departments on one-stop customs inspection at the Moc Bai and Ba Vet border crossings. 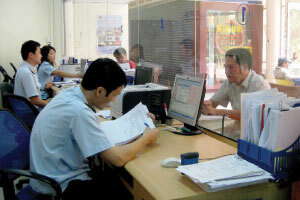 The Vietnamese General Department of Customs also recommended that the Cambodian customs ask the Ministry of Finance and the government of Cambodia and the authorities of Svay Rieng Province to invest in infrastructure for application of the one-stop model at the Moc Bai and Ba Vet border crossings to facilitate trade and transport. 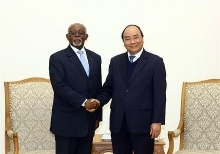 In addition, customs leaders of the two countries suggested that related agencies, particularly border localities, enhance cooperation and share information to boost anti-smuggling focusing on major smuggled goods such as drug, wild animals and plants, alcohol, beer, tobacco, sugar and items which are likely to evade the Value Added Tax. They also need to build infrastructure in border areas and provide sufficient forces at border crossings to ensure effective state management and facilitate exports and imports between the two countries.